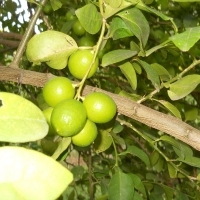 The Lime Fruit is frequently used when green but they do colour to yellow if left on the lime tree. 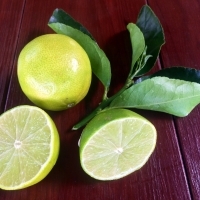 The lime fruit makes an attractive garnish, delicious juice and is used often in cooking. The small to medium fruit is pale lemon-yellow with smooth thin skin. 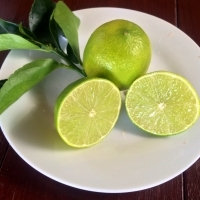 The flesh is a translucent pale green, tender and juicy with a true acid lime flavour. It is best to pick the fruit green as it can suffer from rot if left to ripen on the tree. The small to medium fruit is pale lemon-yellow with smooth thin skin. 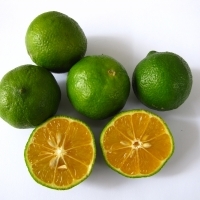 The flesh is a translucent pale green, tender and juicy with a true acid lime flavour. 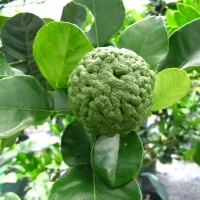 It is best to pick the fruit green as it can suffer from rot if left to ripen on the tree.The dwarf rootstock, flying dragon modifies the top growth making this a dwarf plant that is ideal to use planted out or as a pot specimen. This unique fruit is grown by a local fruit collector. The flesh is bright orange inside the green skin. Used in dressing, marinades and as a colourful garnish. It look like a mandarin but tastes like a lime. 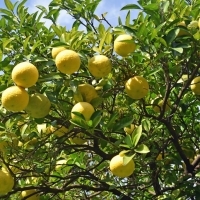 The vigorous nature of the tree makes it ideal for using as a rootstock for grafting other citrus.